Hopwood-based artist Paula Hamilton finds creativity in our midst. David Morgan wrote a funny and interesting article in the December/January issue of The Village about how he decided to join a local art class in spite of being low on artistic confidence. He described going to an introductory day, expecting to see men sporting berets and women in smocks, but was relieved to find perfectly “normal” people in attendance. So with the kind permission of Pam McGregor, the art teacher, and her pupils I visited Alvechurch Village Hall on the first day of the art class term. In the morning the beginners’ class were at work in a warm, cosy side room, with plenty of table space for each person to be creative. Chatting with Pam, it became clear that she uses excellent strategies for developing confidence in her pupils. Setting relatively easy tasks to begin with, she introduces interesting techniques to enable her students to produce a good-looking end product while building skills and confidence. On the day I visited they were experimenting with a resist technique using water colours, drawing simple shapes, applying multi-coloured wet on wet paint and using salt to achieve an interesting textural effect. Lots of techniques were being applied which is just the thing to encourage playfulness and skill-building. 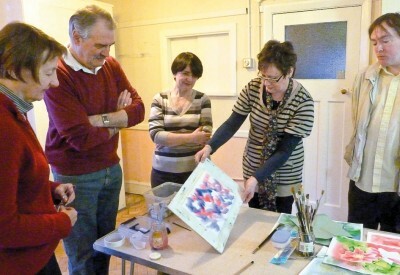 I was really impressed with the atmosphere in the class and the clear enjoyment of the participants. In the afternoon Pam teaches a larger class in the main part of the Village Hall; this is the Intermediate class. On this occasion the 12 regular “intermediates” were offered and instructed in a task of figurative drawing, but this was not a compulsory activity and there was landscape painting, portraiture and other artistic endeavour taking place, much of it of a high standard. The artists were very friendly and willing to talk about their work and there was plenty of skill and quality in evidence. Had I not already spent more years than I care to count studying and teaching art, I would love to sign up for this class. Pam supplies all the paints and equipment, the sight of which is, in itself, enough to get the creative juices going. If your New Year’s resolution is to get more creative and you’d like to join either Pam’s Beginners or Intermediate class, you can contact her on 07809 236880. One of my favourite artists is Grayson Perry, winner of the Turner Prize in 2003 with his stunning hand-built ceramic pots. Recently he has been let loose in the British Museum, to explore thousands of artefacts from many different cultures. Grayson Perry had a troubled childhood; his father left the family home when he was only four years old after his mother had an affair with the milkman. Significantly, the father left behind his motorbike which became a symbol of masculinity to the little boy. For this exhibition, Perry commissions his own motorbike, decorates it as a shrine and travels on it to Bavaria to visit Mad King Ludwig’s gothic fantasy castle before returning to the UK to oversee the completion of the most amazing Funeral Ship. You couldn’t make it up! If you happen to be in London I urge you to visit the British Museum (http://www.britishmuseum.org) to see this exhibition: Grayson Perry and the Tomb of the Unknown Craftsman. Perry’s motorbike and Funeral Ship, as well as his signature ceramic work, all form part of this playful, humorous, imaginative and very unusual exhibition. It finishes on February 26. The American artist Mary Lou Cook said “Creativity is inventing, experimenting, growing, taking risks, breaking rules, making mistakes, and having fun.” This is exactly what I feel about making art and being creative in general. And it sums up what was happening in art classes in Alvechurch just as much as in Grayson Perry’s big London show. This winter has been mild and snow-free and I’m sure most of us would like it to stay that way. But the snow last year and the year before did make our countryside look spectacularly beautiful. When I look at this painting (left) I made last year I remember the freezing temperatures, the sky like a solid grey blanket waiting to drop its snow on us and how stunning it was to look at and be in. I wish everybody a Happy, snow-free New Year. If you have art exhibitions or events coming up, please email me if you think it would make for an interesting article – as well as sending them to The Village What‘s On pages, of course.